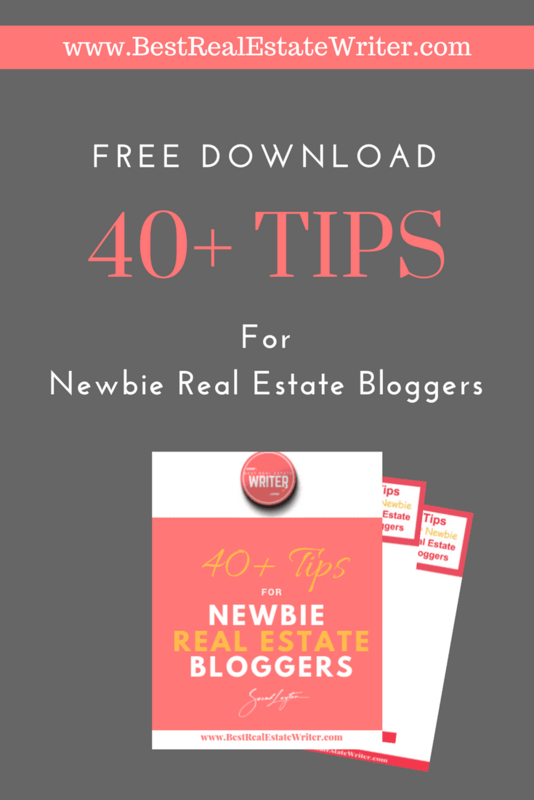 Are you new to blogging and content marketing for your real estate business? You probably have a ton of questions about what types of content to create, how to get your content noticed, and how to leverage that content into profits. 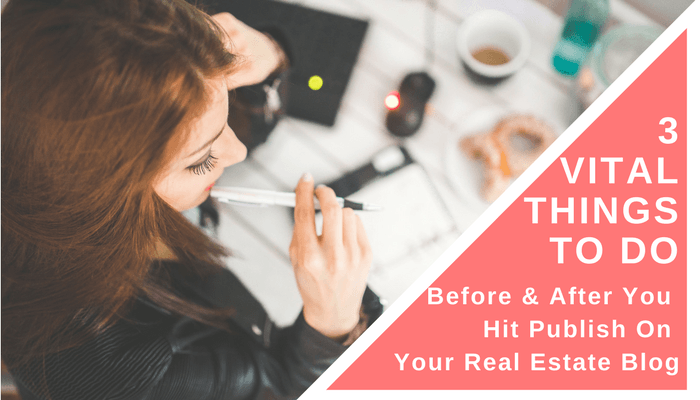 Before your real estate blog really takes off, it can be challenging to weed through all of the bogus information out there about how to build your blog. As always, I want to save you some time and help you make the most of your real estate blog so I am sharing my advice for publishing each article. 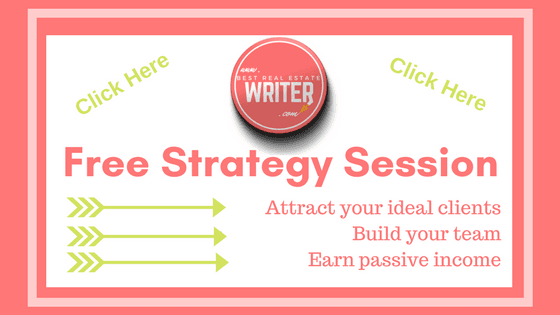 But before we dive in, I would like to invite you to join my Facebook community of real estate professionals learning to leverage a blog into real leads right here. All of the “must-do” tasks in this article will help you to build your audience, earn more passive income, convert more leads, and build the value of your website with search engine optimization. Okay, this one is pretty obvious but it is still worth mentioning. If you write your real estate blog yourself, you should make sure that you don’t embarrass yourself by publishing articles with errors that make you look ignorant. While a few minor errors is fine (Lord knows I write my blog with my own brand of grammar), you need to have the important elements of spelling and grammar correct. Don’t be one of those people that doesn’t know the difference between there, their, and they’re and publish to your blog without a proper editing session. Formatting is another important aspect. Blogs are written in a very different format from the style of writing you were taught in school. Generally, paragraphs are much smaller (1-3 sentences), and there are bigger spaces between them. This formatting is important because it helps to hold a reader’s attention and keep them scrolling. Headings, bulleted lists, and images should also play a large role in the way that you design the of your real estate blog’s format. Each one helps to break up the text and makes an article more scannable, allowing readers to extract the information that is most important to them. Additionally, headings and images play a big part in your SEO. Including images and videos in each of your real estate blog articles will help to increase engagement, as well as, build your social media following and overall brand recognition. I love to supplement my blog articles with three different types of branded images and videos. The first type, is something that helps to further explain whatever point I am trying to make or information I am trying to share with all of you. For example, if I am trying to teach you how to create a marketing funnel, I will include images or videos that show you what I am talking about step-by-step. The second type, is a video about a related topic or blog cover of a related article I have written. I do this in order to keep readers on my blog/website for a longer period and increase their exposure to what I have to offer them as a real estate writer and content marketing coach. The third type is an affiliate image that will lead the reader to purchase something which will pay me a commission. Affiliate programs are essential if you want to build passive income with your real estate blog. If you’re short on time and new to affiliate marketing, I suggest you try SkimLinks. Again, there are three types of links that no blog post is complete without. The first is promotional. Promotional links can be to other articles on your blog, your social media pages, your YouTube Channel, your real estate podcast, or anything else you want to build an audience for. The second is sales. You should always have strategic links that will take your target audience through your sales funnel, or at the very least, filter them through your lead capture devices/pages so you can continue to build a relationship with them. The third is affiliate. At the end of the day, not every reader that lands on your real estate blog is going to be a potential buyer or seller for you. That doesn’t mean you can’t still profit from attracting them to your page. If someone has landed on an article of your real estate blog, it is because they are interested in hearing what you have to say on that particular topic. Present your readers with affiliate links to relevant products and services that will pay you a commission if they sign-up or make a purchase. Again, I suggest using SkimLinks because it requires far less effort on your part than the majority of affiliate programs out there. As I always say, a blog is not a “build it and they will come” situation in the beginning. You need to promote it and get the word out there. 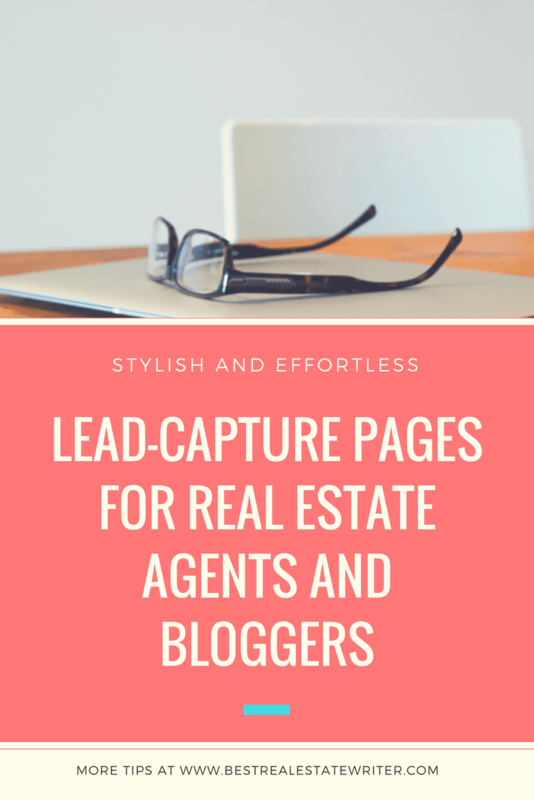 The following three tasks are non-optional in my opinion if you are serious about getting leads and making money from your real estate blog. You have an email list for a reason; use it! Every time you publish a new article to your real estate blog, you need to feed your subscribers with a timely notification that there is valuable new content waiting for them. My favorite time to post new articles to my blog is Tuesday afternoons, followed by an email blast. But, since I post new articles, videos, and podcast episodes each week, I also like to send out a weekly recap email every Friday afternoon with links to all of my new content. I suggest you do the same. Your real estate blog articles should be a very prominent portion of your overall social media presence. Promoting your real estate blog on your social media will accomplish two things for you. It will show your followers that you are worth following because you will be providing them with value rather than being a sleazy salesperson. It will also get you a lot of free traffic back to your blog & website. Always make sure that you always remember to include strategic hashtags in the comments of every post to help you expand your reach even further. The best way to squeeze every ounce of value from each and every blog post is to repurpose it in as many different forms as you can. 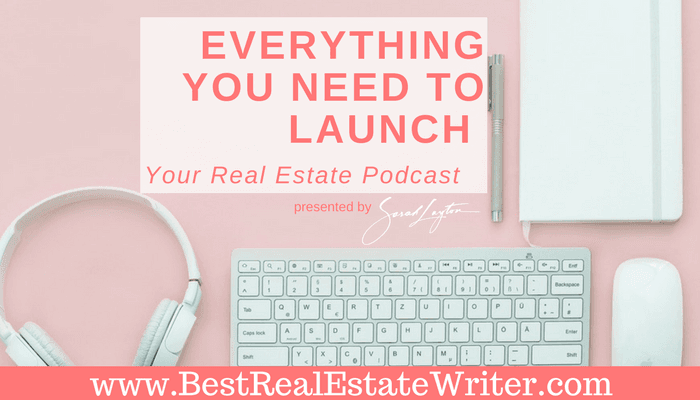 Every article that you post to your blog can be transformed into at least one video for your YouTube channel and an episode for your real estate podcast. If you have been following me for a while, then you know I am a huge believer in the future of audio and podcasts. Just the way video marketing exploded a few years ago, I am confident that audio will be the next big thing because it is even more convenient for people to consume than video was. You should simultaneously be building an audience on all three platforms so that you can maximize your reach and influence. If you are like most people, getting a firm enough grasp on all of this to make it lucrative seems time-consuming and overwhelming. 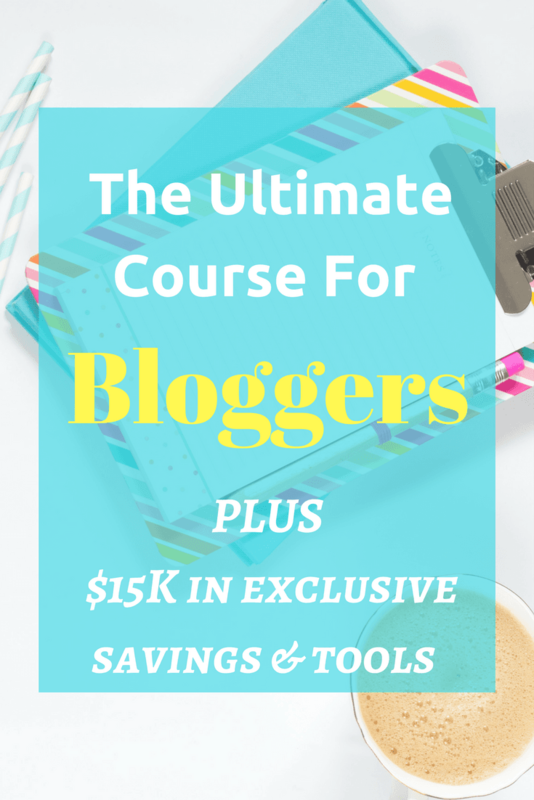 At this point, the easiest way to proceed forward in monetizing your blog is to schedule a free consultation with me to get a personalized strategy that makes sense for you and your goals. Click below to get started.